Sunday March 10th 1878 It was still raining this morning but stopped before noon. We got dinner and then Hatt and I went to the funeral at the North church. Rob went down there as he was one of the pall bearers. I can't tell how bad I felt to know they were going to bury Maggie away from our sight. The services were very appropriate. Soon after I came home we got supper. I wrote to Miss Lewis in the evening Monday March 11th 1878 We did not wash this morning. I went to town and got some paint for Hatts flower stand. I did some mending in the afternoon and was down on the hill watching them make the walk. Weather pleasant. 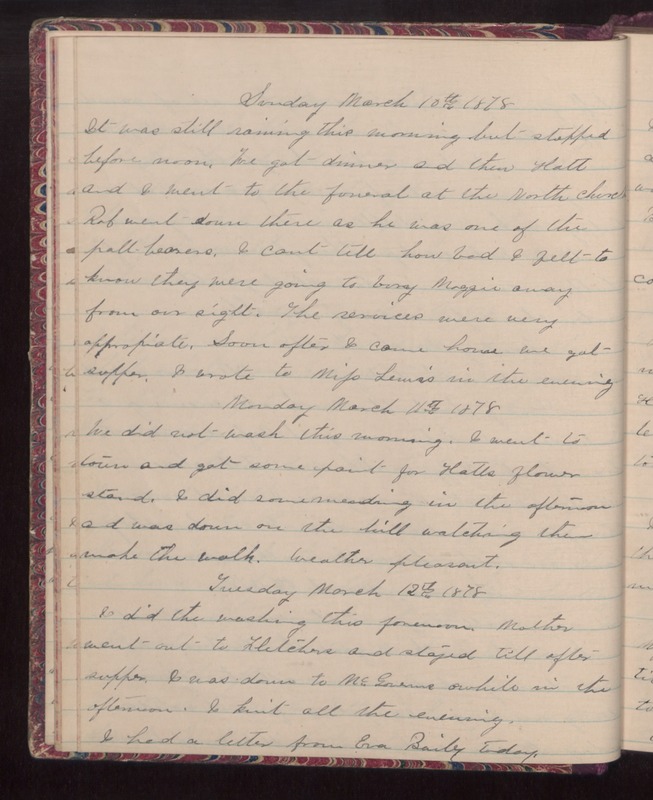 Tuesday March 12th 1878 I did the washing this forenoon. Mother went out to Fletchers and stayed till after supper. I was down to McGoverns awhile in the afternoon. I knit all the evening. I had a letter from Eva Bailey today.